Does a neural network need domain knowledge? Stephen Downes shows how important this question is, so I’ll try my guess. According to the traditional learning theories, we construct knowledge upon existing knowledge, for example by linking the new stuff into the known. When we see knowledge as representation, all the higher order concepts are nicely grown from lower level concepts. But at the very bottom there must be some special knowledge, sort of “seed” knowledge, to enable this recursive mechanism because otherweise we would run into an infinite regression. Even if we use the less abstract idea of “recognition” we might misunderstand it and ask: how can we recognize what we do not already know? The trick is that recognition needs only a part of the features of a pattern to see the whole pattern. The artificial neuronal networks described in the above post, apply such pattern recognition to learn solely from conversations. How far can this approach be extended? To the bottom, to eliminate the need for domain knowledge? Let’s first look at human neuronal networks. The conversations begin long before the human can talk, when the baby has their first gaze “conversations” with their mother, at the age of just a few weeks. It is here that they recognize the world around them, long before they learn propositions about “he, she, it, they”, and even the “I” is learned only via the “thou” in these first bodily conversations. Similarly, how do neuronal networks learn how to find out which response should be trusted? For the little human neuronetworks, the seed trust is given before they need to start reasoning, and it will enable them to add more trust criteria over time. So, I think, while artificial networks need some prerequisite input, human neuronal networks use recognizing from the very beginning and require no indispensable prerequisites. This sheds different light on the idea of prerequisites, and it also makes the idea of a “course” much different from the traditional temporal sequential arrangement. If I encounter prerequisites later, there is still time to cover them (like a rhizome is not necessarily pulled out from the top to the root but often in the reverse direction), as long as the course does not build the stuff of later weeks upon the stuff of previous weeks but uses the weeks’ skeleton only as a schedule of when people can simultaneously discuss a certain topic (i.e., if it is organized as a cMOOC rather than an xMOOC), or even lets the community “be” the curriculum. (which Doug Belshaw spends “five minutes explaining”). Recognition explains the deeper mechanism of learning as not linear/ sequential (not via fixed isolated representations) but as laminar/ all-at-once (multiple connected features of a pattern). Thanks so much Stephen Downes for the idea of recognition. 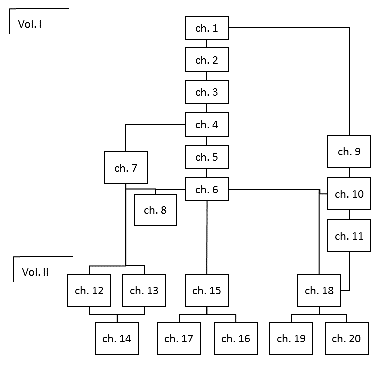 The image above shows the logical dependencies of the chapters of an important textbook of my study (B. L. v. d. Waerden, Algebra I, 8th ed., 1971) which I encountered again as an illustration of linearity in the first German book on Hypertext by R. Kuhlen, 1991. Thanks Matthias for the way you’ve framed this discussion. These notes should be considered questions for I know so little in any kind of depth. If the AI learning process is some sort of regression with back propagation, it is hard for me to see domain knowledge as functioning other than some sort of algorithm that might function like a theory. Belshaw notes the metaphoric nature of learning in your link. Isn’t reasoning also metaphoric at some level and how would neural networks reason if their backend is statistical? A backchannel article by Gary Markus claimed that alpha go is still a hybrid neural network with tree search (or GOFAI). Would not the addition of domain knowledge also represent a type of hybrid? If there is an emergent layer, that might be different. Is there something I’m missing? Thanks Howard for your thoughts and for the further pointers which I will follow. In particular, considering hybrids is a promising idea. I am glad about your visits.